1. Mix together the mascarpone, lemon curd, vanilla extract and icing sugar until smooth. 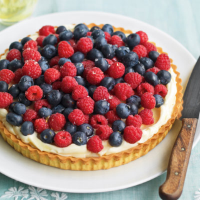 Pile into the pastry case and top with the berries. Chill for 1 hour. 2. Meanwhile, make a lemon syrup. Place the caster sugar and 2 tbsp water in a small saucepan over a low heat. Allow the sugar to dissolve, then increase the heat and simmer for 3 minutes. Remove from the heat, add the lemon zest and leave to cool completely. 3. Drizzle the lemon syrup over the tart and serve.